Lush Fab Glam Inspired Lifestyle For The Modern Woman: Chanel Fall 2011 Couture: Would Coco Chanel Approve? 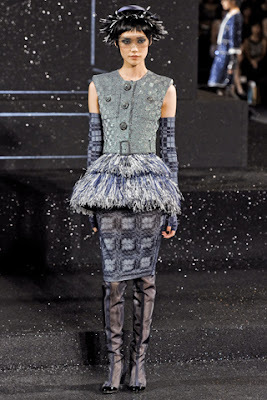 Chanel Fall 2011 Couture: Would Coco Chanel Approve? Chanel's Fall 2011 Couture: Would Coco Chanel Approve? Designer Karl Lagerfield drew inspiration from the iconic Coco Chanel﻿ and the brand's signature looks for the latest Couture collection. Below are a few photos of Karl's interpretation of Classic Chanel Couture design. Do you think Coco Chanel would approve of Karl Lagerfield's Couture interpretations of her classic designs? Leave a comment below. Chanel is not the same as in Coco's days any one who's opened a fashion history book knows that.